I am not the fruit type, I don’t spend money on fruits, fruits are not part of my menu are the words of some people. Some may say they like fruits but they limit it to few. To get the desired result, eat varieties of fruit. In each season try and eat enough fruits, by so doing, you send a lot of sicknesses far away. Experts believe that the type and quantity of fruits one eats affect his health status and fertility level. God created every fruit to serve the purpose of the season in which it comes. Every fruit in every season has a purpose to accomplish in the health of man. When one eats adequately the fruits of any season, such person is indeed building storey of good health. According to a nutritionist, Mrs. Virgy Uzodiegwu, seasonal fruits help the body to build immunity and acquire the health strength that will carry it through the season and beyond. She maintains that one ought to follow the fruits in season as that makes the body resistant to diseases like cancer, tumoure.t.c such seasonal fruits include: cashew, mangoes, cherry (udara) blackberries (icheku) e.t.c. All these contain great natural nutrients that are capable of keeping the body. Cashew is one of the main seasonal fruits. 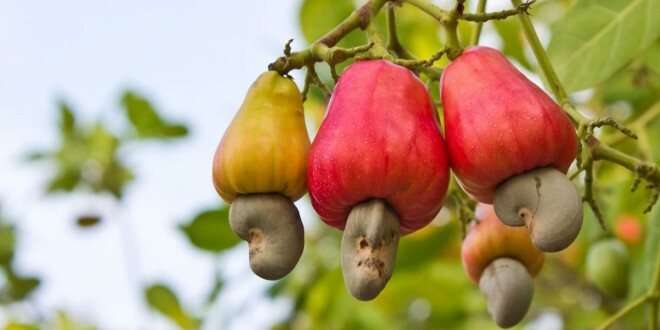 CASHEW is a fruit that has both apple and nut. Each part of a cashew has great nutritional value packed with energy and antioxidants. Cashew belongs to anacardiaceae family and is scientifically known as Anacardium occidentals. Cashew tree is native to Brazil’s Amazon rain forest but Portuguese explorers spread it all over the world. Today, it is cultivated at commercial scale in Brazil, Vietnam, India and in many African countries like Nigeria. CASHEW APPLE JUICE: this is the soft juicy apple shaped fruit on which the nut is attached. Cashew apple juice contains a number of healthy essential nutrients and that is why most health specialists recommend eating one apple each day. There are many people who like drinking the juice of an apple rather than eating it in the raw form. The nutritional value of the apple juice is the same as that of a raw apple, provided it has been extracted from fresh apples. The commercially available juices usually contain preservatives that cut down the nutritional value of apple juice. Hence, making real apple juice at home is the best way to avail the maximum benefits and nutrition. One serving of apple juice provides your body with high amount of vitamins, minerals and antioxidants. With zero cholesterol and a very low quantity of saturated fats and sodium, apples are the healthiest fruits. Cleanser: Cashew apple juice cleanses the whole system especially the liver.The alkalinity in the apples assists in cleansing the destructive toxins/waste by-products from the liver in addition to maintaining the pH levels of the body. Pectin, present in the apple’s skin, promotes the digestive system. Apples are great sources of super antioxidants-polyphenol and flavonoids-that are beneficial for the heart’s health. Furthermore, they provide your body with potassium, an important mineral that is also crucial for the heart. So, taking one serving of apple juice every day facilitates the heart to function properly. One of the unique advantages of apple is that it contains flavonoida. This imperative nutrient is well-known to prevent asthma attacks. In addition, flavonoids play a significant role in making your lungs strong and effectual. It has been proven by latest research that the individuals who consumecashew apple juice on a regular basis has better lung function than the others. Along with the other several benefits of apple juice, an important benefit is its assistance in lowering the cholesterol levels. The excess cholesterol levels in the body are the main cause behind numerous cardiovascular aliments. Thus, you can strengthen yourself against such diseases by consuming an apple or its juice every day. Apples offer a number of healthy nutrients including vitamin C, iron, boron etc. these nutrients combine to make your bone structure healthy and strong. The good amount of vitamin C in apples improves the immune system of your body as well as assists the body in combating germs and bacteria. Apples juice is the best defender against tumors and cancer, especially lung caner. Flavonoids and phenolic acids have proven to be effective in preventing the development of tumors and cancerous cells. These compounds are easily available in apple. Constipation is a severe health issue that occurs when the large intestine absorbs too much of water. Apples contain sorbitol that offers a solution for this problem. When this substance reaches the large intestine, it draws water into the colon. This way, it makes the stool softer and easy to pass. Apples juice has wonderful advantages for the skin and the hair. It is widely used in natural remedies for treating skin-related issues like inflammation, itching, cracked skin and wrinkles. The application of apple juice for a few minutes to the hair scalp ensures the prevention of dandruff and other scalp disorders. Cashew are high in calories, 100g of nuts provide 553 calories. They are packed with soluble dietary fiber, vitamins, minerals and numerous health-promoting phyto-chemicals that help protect from diseases and caners. They are rich in “heart-friendly” monounsaturated-fatty acids like aleic, and palmitoleic acids. These essential fatty acids help lower harmful LDL-cholesterol while increasing good HDL, cholesterol in the blood. Research studies suggest that Mediterranean diet which is rich in monounsaturated fatty acids help to prevent coronary artery disease and strokes by favoring healthy blood lipid profile. Cashew nuts are abundant sources of essential minerals. Minerals, especially manganese, potassium, copper, iron, magnesium, zinc, and selenium are concentrated in these nuts. A handful of cashew nuts a day in the diet would provide enough of these minerals and may help prevent deficiency disease. Selenium is an important micronutrient, which functions us a co-factor for antioxidant enzymes such as Glutathione peroxidases, one of the most powerful antioxidants in the body.Copper is a cofactor for many vital enzymes, including cytochrome c-oxidase and superoxide dismutase (other minerals function as co-factors for this enzyme are manganese and zinc).Zinc is a co-factor for many enzymes that regulate growth and development, gonadal function, digestion, and DNA (nucleic acid) synthesis. Cashews are also good in many essential vitamins such as pantothenic acid (vitamin B5), pyridoxine (vitamin B-6), riboflavin, and thiamin (vitamin B-1). 100g nuts provide 0, 147mg or 32% of daily-recommended levels of pyridoxine. Pyridoxine reduces the risk of homocystinuria, and sideroblastic, anemia. Niacin helps prevent “pellagra” or dermatitis. Additionally, these vitamins are essential for metabolism of protein, fat, and carbohydrates at the cellular level. Further, the nuts are also hold a small amount of zea-xanthin, an important pigment flavonoid antioxidant, which selectively absorbed into the retinal macula lutea in the eyes. It is thought to provide antioxidant and protective UV ray filtering functions and helps prevent age-related macular degeneration (ARMD) in the elderly.